“If Allah didn’t want me this way, he wouldn’t have made me this way,” says Omeed. He’s a 27-year-old Dutch guy who believes he’s basically a good person and, therefore, a good Muslim too. But he’s also openly and unashamedly homosexual. How does he fit the two together? Omeed (not his real name) was born here in the Netherlands, but his parents are first generation immigrants from Pakistan. He describes his family life not so much as strictly Islamic, but certainly ‘traditional’ with strong Muslim values. He did all most of ‘normal’ Islamic things, like observing Ramadan and studying the Qur’an. As a result, he concluded quite simply that this is the way he’s ‘meant to be’. After all, coming from a traditional, ‘heterosexual’ Muslim family, clearly... “There’s no choice or ‘learned behaviour’ involved. I am as I am, I think I’m a nice and a good person. I don’t do any harm to anybody – at least I try not to do so deliberately – and that’s more important than my sexual inclination”. Omeed acknowledges he is an exception in the Dutch Muslim community, where homosexual men and women seldom come out 100 percent as most of their ethnic Dutch counterparts do. However, he says more and more gays and lesbians from a Muslim background are coming out partially – i.e. carefully, to a very select circle of friends and – in some cases – family members. But basically, Omeed says he believes Allah wills and makes us to be the way we are, and if you can accept that then you can accept your own sexuality too. 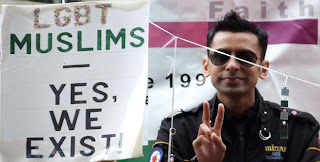 His advice to other young Muslims – and, come to that, anyone from a conservative-religious community - facing up to their homosexual feelings is not to make a problem out of their religion or let the religious interpretation of ‘others’ stop you being who you are. Nonetheless he recommends that young gay Muslims be cautious about who they come out to, but not let this prevent them seeking support, either from friends or professionals. Although he’s never been a victim of real aggression, he knows it’s out there and that in the larger Muslim community homosexuality remains taboo. Well i found nothing written about homosexual any where, so Omeed this is your self desire, be a men that would be better for you.